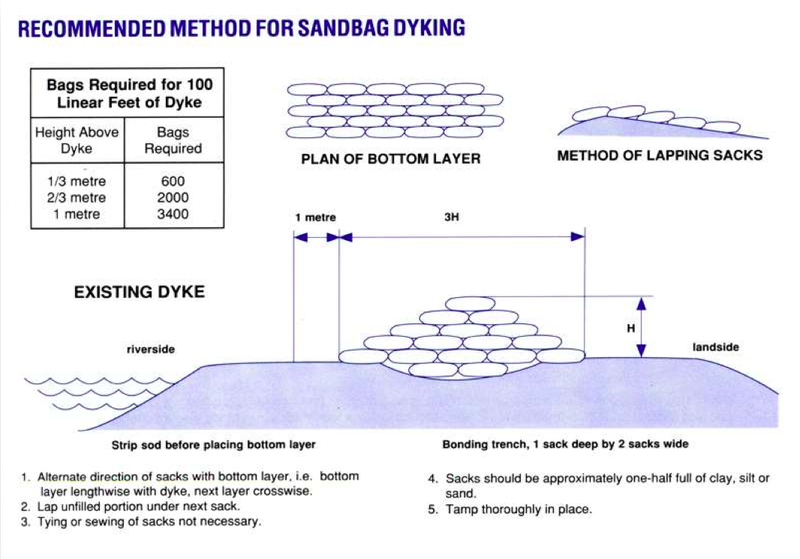 If you choose to construct a sandbag dyke to protect your property, you will need to follow specific steps to ensure that it is effective. Dig a trench one sack deep and two sacks wide as a foundation for the dyke structure. To effectively resist the forces of flood water, a dyke needs to be 3 times as wide at its base as it is high. For example, a 1 metre (~3 feet) high dyke needs to be 3 metres (~10 feet) wide at the base. Fill sandbags only half-full and lay them in alternating crisscross directions. The base level should be laid in the same direction as the water flow, the second level should be laid perpendicular to the direction of the water flow, and continue laying the bags in alternate directions. Each layer needs to be set back one-half sandbag width on both sides from the previous layer so that the cross-section looks like a triangle. Individual bags need not be tied shut. Overlapping the bags will hold the sand in place. Tamp each bag firmly into place, to ensure that the finished dyke works properly.